TJ Boyers is Arps Dairy’s sales consultant. “I find new customers and work with current customers as a solutions provider. 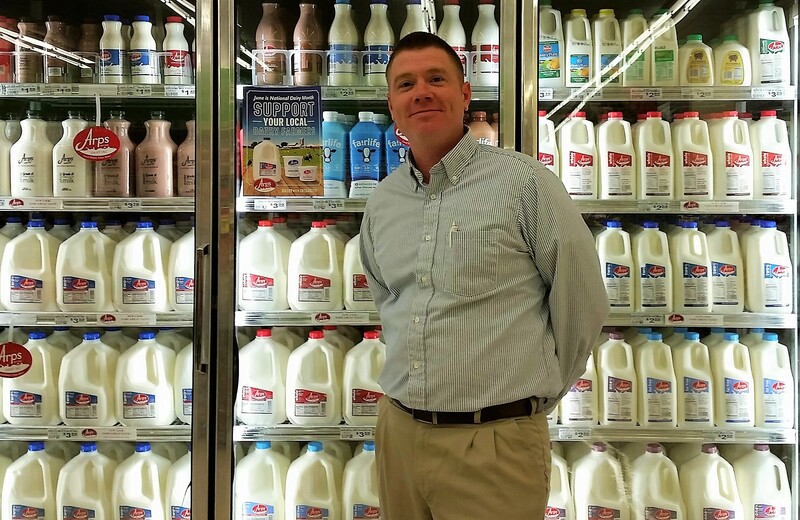 I help customers see the value of Arps Dairy,” TJ explained. TJ holds a pivotal role in the success of Arps Dairy. TJ is charged with bridging the gap between a potential customer’s needs and the products and service that Arps Dairy offers that can fulfill those needs. This is accomplished through following the Foundation for Results process and the belief that transformation begins with strong foundational relationships. This is why the heart of TJ’s responsibilities include creating and maintaining relationships with both new and existing customers. TJ has fond memories of Arps Dairy dating back to his childhood. “Growing up in Defiance, Arps Dairy was all I ever had at home and at school. Back then there were much less dairy options to choose from, and while now the dairy isle offers many different brands and even dairy alternatives, I’m proud that I work for an organization who has stuck by their core beliefs and continued sourcing their product from small, local family farms,” TJ explained. “And, I’m proud to be the individual who gets to offer our delicious, fresh and local product to new communities who desire locally sourced food produced in the most responsible manner possible,” TJ went on to state. When asked about his hidden talent, TJ explained that, “My hidden talent would be the ability to manage my son’s diabetes. This is a skill I thought I would never wrap my head around. He was diagnosed two years ago and its just common practice now”. TJ would like the community to know that the Arps Dairy family of employees are dedicated to supplying everyone with a high quality, fresh product. As a part of National Dairy Month, Arps Dairy is donating a Dairy Care Package to TJ for him to give to someone he feels is deserving. TJ has chosen to pass his Dairy Care Package on to family members who have helped support and shape his own family.